Lunch break: Those who wish to eat may do so at this time. Fast breaks at dawn Monday. Sliding scale available. No one is turned away due to lack of funds. It is recommended to memorize, or at least become familiar with, the Nyungne mantra. Click here to download the mantra. Gelongma Palmo, a completely enlightened nun who was born a princess in the 8th-century but renounced her royal birthright to pursue the spiritual life, conceived of the Nyungne practice. As an early monastic, she contracted leprosy and was shunned by her nunnery. 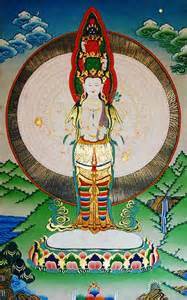 Due to her excellent abilities, she developed her "fasting ritual" practice with great devotion to Avalokiteshvara and was able to overcome her disease and attain enlightenment. The practice retreat is performed in several sessions of in a two-day closed retreat that includes fasting, silence when not in practice, and prostrations with mantra recitation. Unfortunately, RigDzin does not have the capacity to accommodate overnight guests, so retreatants will maintain their retreat vows and return to their homes after the daily practice. 1. Those who cannot fast during the retreat because of health reasons eat breakfast and lunch on both days but refrain from dinner. 2. Those who can have a limited fast during the retreat. devotion and praise to the Eleven-faced, One Thousand-armed Avalokiteshvara, Bodhisattva of Compassion. Through the pacifying effects of the mantra recitations, there is great benefit for all sentient beings in the world. The retreat begins with a vow to maintain the Eight Pratimoksa Precepts to abandon killing, stealing, lying, sexual activity and intoxicants, and the precepts to refrain from sitting on high seats or beds, singing or dancing, and eating at improper times of the day. These simple but profound promises help to avoid defiled thoughts and destructive actions during the retreat and hopefully, carry-over to post-retreat behavior habituation. Khenpo Tsultrim wishes many sangha members and supporters with all levels of confidence to participate in the retreat. The benefits are very profound for personal growth and to bring peace to the world. begins. It is recommended to memorize, or at least become familiar with, the Nyungne mantra. Click here to download the mantra.